Welcome back, everybody! We hope you all had a wonderful holiday season with your families and loved ones. Many of our loved ones often have dangerous jobs with lingering statistics looming over their heads each year. To start this year, we want to raise awareness around these hazards that exist in our industry and how they can be prevented. Last year (and each year since 2013), there were approximately 30,000 arc flash incidents with 7,000 injuries and 400 fatalities as a result in the United States alone. Most of these accidents occur when qualified persons disregard LOTO protocols and/or do not have an extra redundant check verification for total safety. I come from a family of plumbers on my mother's side of the family and for a time in high school I followed the same path. All those years ago, I often found myself in ditches with no trench box or working on jobs with people who didn't feel like wearing a hard hat. While thankfully, no one ever suffered fatalities as a result of their carelessness; enough incidents and injuries occurred to inspire a change. Today, that company mandates safety from top to bottom. Trenches will have trench boxes at all times and everyone is required to wear a hard hat on construction sites, to name a few standards. These mandates also come as a requirement from responsible general contractors who often require a safety course to be completed before subcontractors can begin working on a job site. What I'm trying to say is safety is getting bigger, baby! While we want to minimize and diminish the amount of hazards that exist in our industry today with Permanent Electrical Safety Devices (PESDs); the most important thing is that business owners and managers are talking about these things and actively pursuing mandatory safety standards to protect their employees. Without the strictly enforced rules coming from the top, a new guy like myself in high school may not even know that there is even a safer option for the task he is performing. We're very excited to start these conversations and show men and women in our industry the options they have to provide an extra layer of safety they may have never known they could have. Stay tuned! 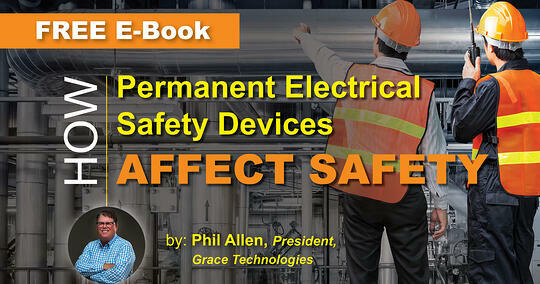 To learn more about PESDs and how they improve electrical safety, download the free E-Book by Phil Allen, President of Grace Engineered Products, Inc.